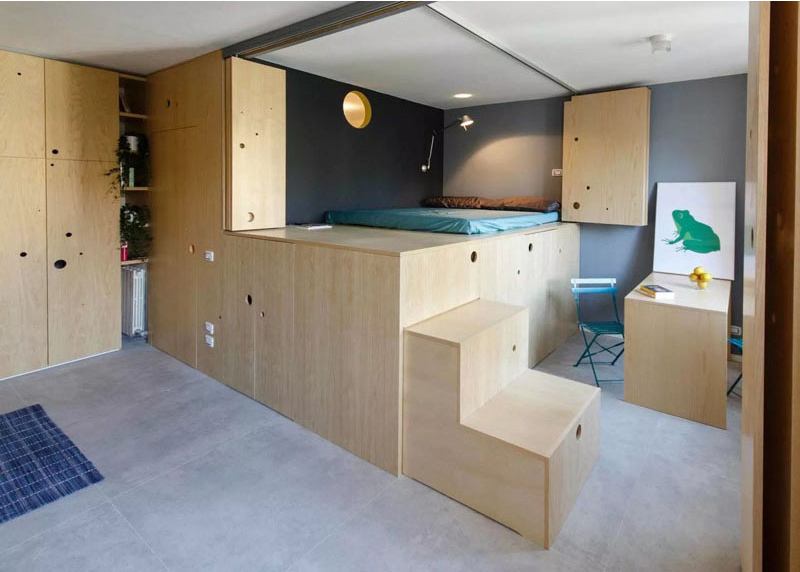 You'd be surprised how this small apartment looked totally big! How many times have you seen an small apartment that has a lot of things around it crowding the space? For sure, you have seen one and these are the ones that are not designed by professionals but if you get to see what an aparment looks like when experts are involved, you will be mind blown and you will realize that there is actually a lot that you can do for a small apartment especially in terms of layout and storage. Actually, we have feature inspiring spaces like this before and we have another one today. 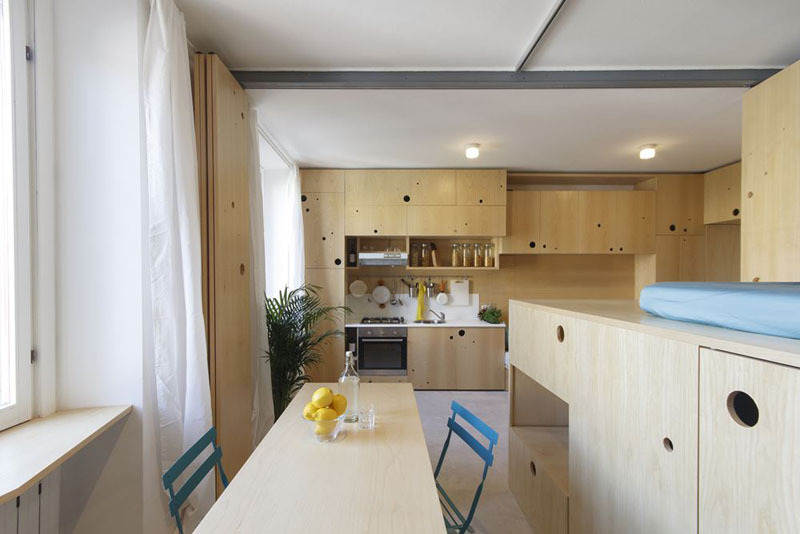 This small apartmetn is just measuring 322 sqft (or 30sqm) located in Milan, Italy. It may be small, but it has everything one needs, including a kitchen, lounge, bedroom, bathroom and dining room. When designing the apartment, PLANAIR had to get creative in the layout to make everything fit and include as much storage as possible, while keeping the apartment light and airy. The result of their design is very impressive and you will surely be surprised of how it turned out. 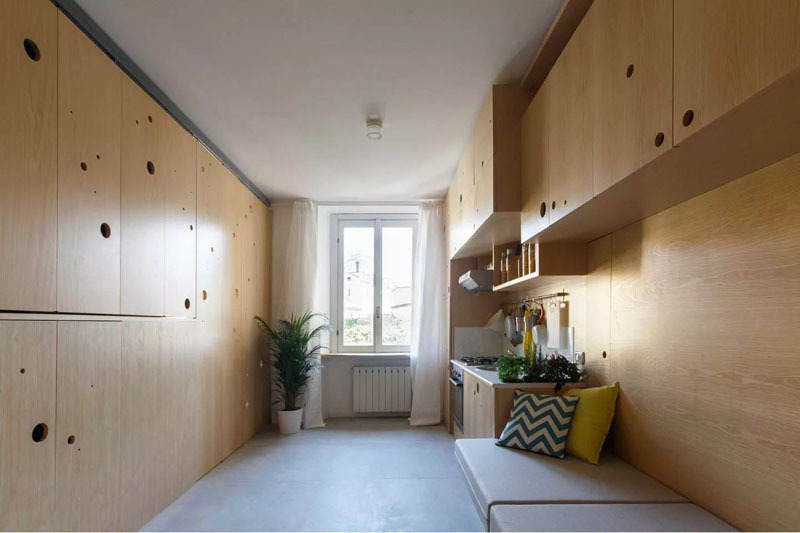 Unique feature: A small apartment with creative ideas and storage systems. Looking towards the window from the front door, you can see that the lounge and kitchen run along one wall in this tiny apartment, with the opposite wall hiding the bedroom and dining room. The front door opens up into the lounge and kitchen area, where there are plenty cabinets for storing food, clothing, books and others. Next to the bed is a work / dining area with room for four people, and there’s a small window ledge built into the design as well. Here you can see how the wall opens up to reveal the bedroom and dining room. Another view of the wall opening up, showing the bedroom. Once the wall is opened up you can see that the bed is lofted, there’s a dining room and another window adding more light to the apartment. The stairs to reach the lofted bed can be neatly tucked out of the way, and if you’re wondering where the entry to the bathroom is, it’s next to the shelving unit with plants, on the right-hand side. The bathroom is located behind the black wall with the porthole window. Isn’t it nice that the steps that leads to the sleeping area can be kept when desired? It sure is a nice idea if you need more space in the apartment. 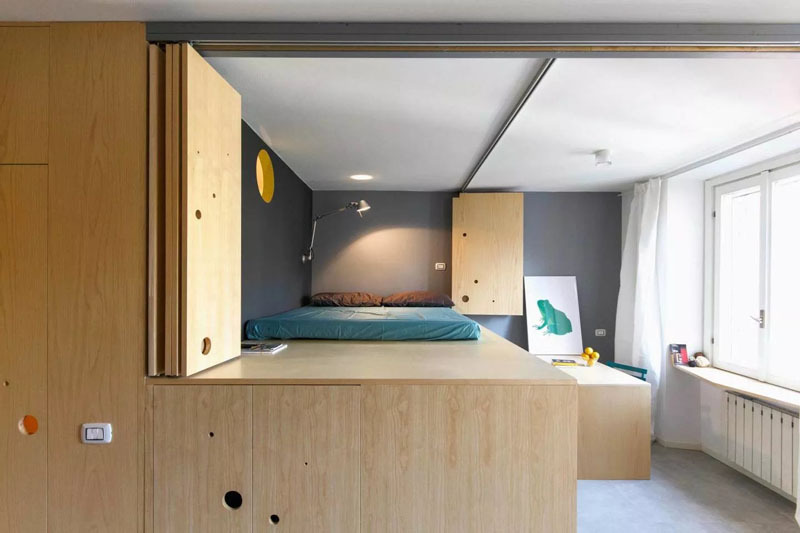 As the bed is lofted, that makes it possible to add extra storage to the space, but with this design, they’ve made it so that the bed can be raised and you have access to a small walk-in wardrobe underneath. In the bedroom, the air condition unit was also hidden located above a built-in bookshelf. Well, it is obvious that it is indeed the goal of the designers. Also, you can see lovely cool colors in the bedroom as well through the throw pillows and the blanket. Here’s a look at the bedroom when it’s all closed off. Some light still gets through from the small holes in the plywood doors that are a common theme throughout the apartment, and they also double as hand holes to open the cabinets and doors. 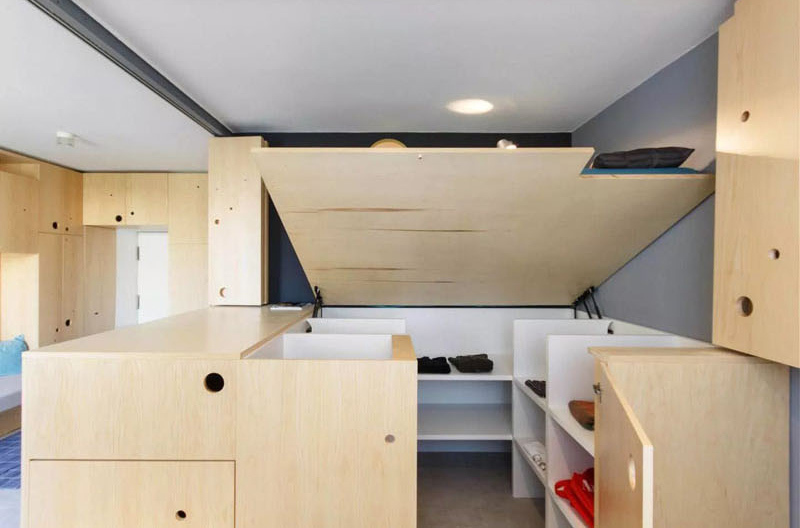 It is indeed always amazing to see a home that maximize the space by smartly using storage. You can see that the apartment may be small but it looked big because of all the transforming items. For sure, you didn’t expect to see a bed inside a cabinet, did you? It is amazing that the aparmtent could look totally different in one time and will look exactly like a comfy home in another time merely just by opening doors and cabinets. This is a work of Planair Studio which resulted into a beautiful apartment interior that is totally mind blowing in terms of storage design.